After a lively discussion of ideas for the garden design next semester, we wrapped up CUFSP meetings for the semester and will reconvene in January upon our return from winter break. A few ideas were pitched by group members, such as biointensive gardening and permaculture. We decided when we get back we'll have an extended design session where we bring all the information and ideas we come up with over winter break and throw them out to be incorporated into the garden. Feel free to discuss ideas/observations/suggestions on the CUFSP wiki, cufsp.pbwiki.com. We will also be expanding the garden! We received permission to expand into the grass plot adjacent to the east plot in Pupin Plaza. We also received the New York City Housing Authority's official endorsement of the Grant Houses Community Garden Project! See grantgarden.blogspot.com to check progress on that project. On a sad note, our garden shed disappeared over the weekend. All its contents were nicely left in the west garden plot but the shed disappeared from its place at the back of the plaza. If anyone has any idea of its whereabout please email rmd2154@Columbia.edu. Its our duty to help realize these goals! 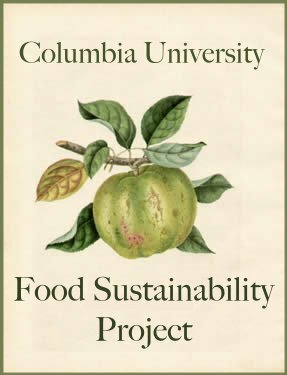 Lastly, if you are interested in helping plan the 2nd Annual Northeast Real Food Summit (college students working to support sustainable food) coming up in February, contact Alison Powell ap2365@barnard.edu. It will be held Feb 21-22 at UMass-Amherst.